Nobody (myself included) likes packing boxes and moving. Packing everything you own is a real pain! I’ve had the unfortunate task of moving many times, and usually the only redeeming thing about the experience is the excitement of a new destination. But, there are ways to make it a better experience, believe me! For example, it makes a big difference if you pack your moving boxes differently than most people do. That way, your belongings will arrive in one piece and well-organized — so there will be less stress when you’re unpacking them at your new place. #1 – Pack little items in and around your larger items. This is the Golden Rule when it comes to packing boxes. Your box space and moving truck space is limited — so make the best of what you have by utilizing all of it. Whenever possible, smaller items should be packed in and around larger items. TIP: For organization’s sake keep items from the same room together. #2 – Use clothes, towels, and bedding as packing material. Use your clothes and bedding to pad fragile items or to fill empty spaces in boxes — instead of using packing peanuts. Not only is this eco-friendly, it will also save space. If you’re worried about them getting dirty, put your items in reusable garment bags or plastic storage bags before using them as filling or padding. TIP: Use dish towels and potholders to buffer and separate breakable dishes and glassware. #3 – Pack off-season items together, so they’re ready to store at your new place. Plan ahead and save time by sorting all of your out-of-season clothing and bedding ahead of time. Store them in clear comforter bags — so you can easily see the contents. Best of all… these soft packing boxes can be squeezed in and around other items that you’re packing to move. TIP: Store stuffed animals and pillows inside comforter bags for easier storage and transport, as well. Trash bags work great, too! #4 – Keep box continuity, in terms of contents and sizes. Try not to mix up items from different rooms inside your moving boxes — that will just make unpacking more difficult. In order to avoid this, make sure you use the right box sizes. Don’t feel like you have to get the biggest boxes and fill them with whatever fits inside from various rooms — because it will actually take you longer to sort through and put away those items in your new place. TIP: It’s worth it to pack and carry several smaller boxes with contents that make sense than to move fewer larger boxes with mixed contents inside. 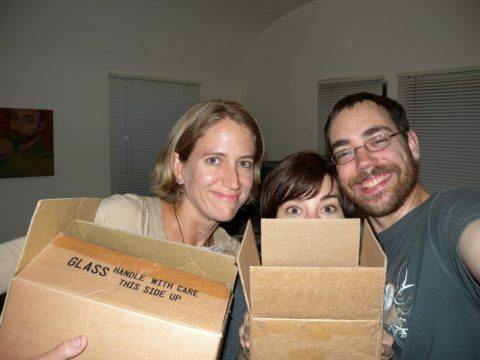 #5 – Photograph the contents inside your moving boxes, so you’ll know what’s in each one. Avoid having to open and reseal boxes because you forgot what was inside. You can either print out photos and tape them onto the boxes, or keep the photos on a device like your smartphone or iPad with a corresponding number written on the boxes. TIP: A picture really is worth a thousand words! #6 – Pack light bulbs separately from lamps. Avoid shattered light bulbs by removing them from your lamps before moving. Place the bulbs in a Christmas ornament box, or wrap them in bubble wrap inside a well-padded box. TIP: Wine boxes with dividers work well, too. #7 – Put paper files & documents in small packing boxes. When packing paper files and important documents, it’s important to choose the right size box. Otherwise, all of the papers will come loose and become a jumbled mess. Store papers upright in their file folders (and in order!) — exactly as they were in your filing cabinet. Then, when you get to your new place, just lift them out and place them directly into the filing cabinet again. Be sure to store your important docs (like passports and birth certificates) inside a waterproof bag as well — for extra protection. TIP: If your files are disorganized, I would recommend getting them in order well before your moving day. You will already have a lot on your plate as it is. #8 – Pack shoes inside wine boxes. Put shoes in a wine box to protect them from getting scuffed, smashed, and separated during the move. The dividers work perfectly to keep the shoes with their mate! Having your shoes organized makes it easy to unpack them and put them back onto your shoe rack in your new place. TIP: Packing shoes in divided wine boxes also keeps the soles of your shoes from getting other things in the box dirty. #9 – Pack heavier items first, then lighter items. 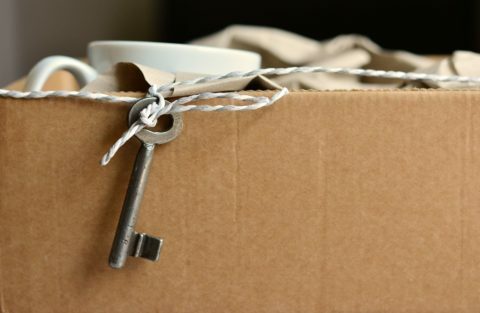 This will ensure that your lighter items don’t get crushed inside your moving boxes. It will also make the boxes less likely to tip or fall over in the moving truck. Plus, boxes are much easier to carry when packed this way — because the weight is more evenly distributed inside the box. Your packed moving boxes should be around 30 pounds max, depending on the size of the box. TIP: If you underpack a box, it could collapse when placed underneath a heavier one — so try to fill all of your moving boxes to the top. Stuff blankets, linens, and other soft items into any empty spaces. #10 – Use suitcases with wheels for heavy items — like books. Many people pack their rolling luggage bags with clothing — because that’s what we’re used to doing when we travel. Consider using them for your heavier non-clothing items instead. Spare yourself pulled back muscles and pack books, magazines, and other heavy items into rolling suitcases. TIP: Clothing is easy to pack tightly into boxes. And boxes of clothes are easy to carry, too — because clothing is so lightweight. The main takeaway that I’ve learned from my moves is to get creative with packing techniques and materials — it saves you time and money in the long run! I hope that these tips for packing boxes will help you have an organized and less stressful move. Like these tips? I have a few more great packing tips for your whole house. Our guest writer, Karli, works for Simply Self Storage, a self-storage and moving supplies company — so she has plenty of firsthand experience with packing and moving! Karli enjoys helping people simplify their moving experience by sharing unique packing tips for the kitchen, living room, bedroom, bathroom, and home office. I like to help people find unique ways to do things in order to save time & money — so I write about “outside the box” ideas that most wouldn’t think of. As a lifelong dog owner, I often share my best tips for living with and training dogs. I worked in Higher Ed over 10 years before switching gears to pursue activities that I’m truly passionate about. I’ve worked at a vet, in a photo lab, and at a zoo — to name a few. I enjoy the outdoors via bicycle, motorcycle, Jeep, or RV. You can always find me at the corner of Good News & Fun Times as publisher of The Fun Times Guide (32 fun & helpful websites). Stay up to date with what's happening on The Household Tips Guide. From Organizing & Cleaning tips to Home Decor and DIYs... you'll always be the first to see these helpful tips as soon as we publish a new article.